Anywho - I've been very upfront and honest with you about my health journey over the past year or....so I thought! 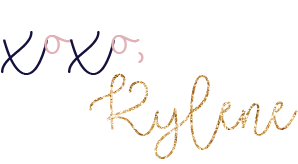 I realized recently that while I chatted with my newsletter VIPS and talk extensively with my personal clients about it I never created a post about my H Pylori experience....so here we go! In July 2017 I got my stool test back. Good news - there was only one thing that showed up. Bad news, it was H Pylori. It's a spiral shaped bacteria found in the cell lining of the stomach. You can acquire it from eating uncooked foods, drinking impure water, and saliva. Most likely if you have it your spouse does too. Your likelihood of infection is equal to a persons age whether they are symptomatic or not. H. Pylori and doesn't know it! How the heck do you have a bacteria overgrowth and not know? Well, sometimes the symptoms can go unnoticed. Or if you do notice them, you don't attribute them to the actual problem. H Pylori causes 90%+ of duodenal ulcers 80% of gastric ulcers and infected people have 2-6x increased risk of gastric cancer. Oh my gosh Kylene, why are you sharing this?! You're a practitioner - shouldn't you be sharing success stories? Well I'm sharing this because I want to be HONEST with you. Sometimes these buggers are flat out hard to kill. One of the downsides to this particular test is that it doesn't give you a measurement. I've since moved on to using another test that does which is very helpful. This would allow me to see how much progress I made during the first round of treatment. Why would it still be there? Severity of the initial imbalance. Like I mentioned above its a bummer I couldn't see the progress level on the test, but ultimately that's information I don't need. If it shows up, there are enough present to take action. I wasn't quite as strict as I could have been round #1. I still did things like drink coffee and splurge on sugar which are things that can feed or create a happy environment for the little suckers. Duration of the imbalance. This may be something I've had for 2 years or it might be something I've had for 10. No way to know! Well what the heck do you do now? You already went through the protocol - do you do it again? How do you know it works? Just like sometimes it takes a few round of antibiotics, or a few DIFFERENT antibiotics to kill a particularly difficult bacteria or viral infection, the same is true when using herbal remedies. In fact, potent herbal remedies taken over a longer period of time have been shown to be more effective than short term antibiotics for gut dysbiosis and imbalances. This can be due to the fact that antibiotics wipe out the good bacteria as well as the bad, leaving you susceptible for another negative bacterial overgrowth. Antibiotics, birth control, prescriptions and NSAIDS have all been shown to cause gut imbalance and inflammation as well so that's not a route I'm willing to go. The second round of my protocol did change slightly. We tweaked a few things and I doubled down on details like replacing my toothbrush regularly, watching my sugar, and ditching coffee until I get the all clear. Do I think it's working? Absolutely - whenever I'm on the protocol I feel AMAZING. I basically don't get sick and if I do it's short lived and easily overcome. I have tons of energy, and well....I just generally feel better. Interested in weekly updates? Sign up for my newsletter here! Ready to start working on YOUR gut? Jump into my 8 week gut health program where I ease you in slowly with weekly challenges, tons of information, questions and answer sessions with me, recipes, detox tools, and upgraded testing (optional)! CLick "Get Gutsy With me" at the top of this page or email me at: KyleneT@thetinyfitdiva.com to get started - you only have a few days left to register!!!! !